The most recent children’s book in the Winston Breen series, this one has some wonderful elements in it that surpass the previous books, including culture (music), and pathos (end of life.) As with others in the series, the point of the book is to offer interesting word puzzles for the readers to solve along with other characters in the book. At the same time, there are ample puzzles scattered throughout that can be solved just for fun. If you wonder why this qualifies for good children’s literature, it’s because despite the insertion of puzzles, the book offers a well-constructed plot, with convincing characters, and a drama that unfolds just like a mystery. It is more or less harmless entertainment, with only one element of something slightly scary towards the end, where the children are temporarily locked in a shed by a shady character. However, even this element serves to highlight the character development, where one of the least-liked characters becomes the hero. All in all, a nice children’s book for readers who enjoy puzzles along with reading. 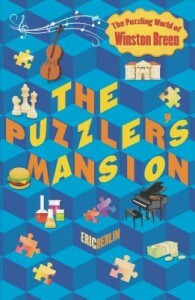 And adults who like puzzles might just want to read along too!